THE TIME WARNER ICE CREAM TRUCK VISITED US ON FRIDAY! Time Warner, I thought they were a cable company not a ice cream company? Well this summer they are both. Time Warner is sending ice cream trucks around the metropolitan area serving kids all over ice cream for just 1 buck! Great deal! But there is more that dollar is than donated to help local food pantries that distribute food to families in need. Really cool! Read the article below for more info. Anyway Time Warner Truck came to our North Shore school P.S.373R and everyone had a truly delicious time. Click on the picture above for slide show of 373R’s students enjoying their ice cream. July 08, 2008Time Warner Cable is using a favorite summer food to raise money to feed needy residents of Bergen County and elsewhere in the state. NY1’s Samantha Liebman filed the following report.Tuesday’s heat made it an appropriate day for Time Warner Cable, the parent company of NY1, to debut its ice cream truck for the summer in Palisades Park and Englewood. The truck is part of a program to help raise money to provide food for those in need. The money raised will go to food pantries in the New York/New Jersey area, like Englewood’s Center for Food Action. During the summer, food donations also decrease. 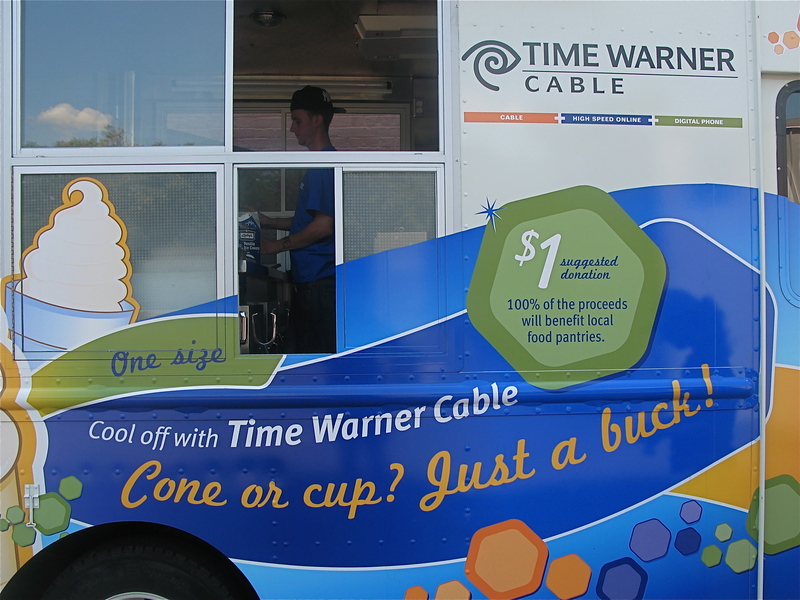 The Time Warner Cable ice cream truck will be at outdoor events all around Bergen County through August 23, with a goal to raise $10,000. The truck will also come to events by request. Neighborhood groups, nonprofit organizations and anyone hosting a public event can call 877-SMMR-TWC to schedule a visit by the truck. ~ by stufffromthelab on July 28, 2008. I loved the Time Warner Ice Cram Truck !!!!! All of the children enjoyed their treat and the staff on the truck were terrific. I want to thank Time Warner cable for offering this excellent service to our community. I applaud the fact that all the proceeds from the sale of the ice cream at a very affordable 1 dollar goes to help feed our neighbors in need. Bravo Time Warner for an excellent idea, and I really enjoyed the ice cream as well. I think that is was nice of Time Warner Cable to give people money for food. By selling ice cream for one dollar kids that are hot in the summer and need a cool snack get one, and people who need food get it. The truck that came to our school the people who served the ice cream were very nice. My computer teacher arranged it. Please come back. Time Warner should buy cable from Time Warner because they do good things with profits. The ice cream was good. Time Warner Cable is doing a good job helping people who need food. The people who are in need I am glad that you are helping them and I hope the food helps and they have a good life. I thank Time Warner for doing this and I hope you come back to P.s.373 R.
Time Warner’s Cable ice cream truck came to our school all because Ms.Broderick arranged it, Ms. Rosen too. I had fun getting the ice cream. I think it is great that you are supporting people who don’t have food with money for food pantries. I think more big companies should do things like this. I think that this is a good idea for people who need help. I think it was good that come to schools and sell ice cream for a cheap price. Just by eating ice cream you get to help someone who needs help. Please come back. I had vanilla ice cream with rainbow sprinkles. But I was surprised to hear I was giving to charity just by eating ice cream.I am happy that someone is collecting money for people who need it. Time warner really did a nice job with this. Thank you. This is Jacky and i want to say “thank you” for the ice cream by the time warner cable.i hope you guys come back in the summer because, not to be fat but i want more ice cream because i like the chocolete wth chocolete sprinkle. i will be here for next year so i want to get ice cream for the summer next year also again “thank you”for the ice cream. i also want to know is it for free? My name is Quentin. I had A vanilla cone with rainbow sprinkles. I would like you to come again to Ps.373r thank you. My name is Quentin. I had A vanilla cone with rainbow sprinkles. It was slammin! I would like you to come again to Ps.373r thank you. Hi I am Frank from Brother’s Who Care Inc. Your truck came to our event in West Brighton Earlier this month. I also Work at P.s.373R. Great Job everyone enjoyed the ice cream and we love knowing we are helping people in need. Hi my name is Daniel and I go to P.S 373R . When the ice cream truck came I was full of joy . I was so Happy . I Had A chocolate and vanilla Swirl with rainbow sprinkles. Thank you for coming to our school. I had chocolate ice cream with chocolate sprinkles. It was good. I think it’s helpful that you are getting money for food to give to people who don’t have it. The ice cream I had was vanilla with rainbow sprinkles. I hope everybody inthe world get ice cream. I think it nice that you are helping people who do not have food. Thank you for helping people who don’t have house or food. I love ice cream and every time I taste it makes me feel like I am in a different world. I always wait for the ice cream truck at my house. I was glad it came to school. I got vanilla ice cream with rainbow sprinkles. I enjoyed the ice cream. I think it is a good idea that you are helping people get food with the money you make. When people don’t have any food they are hungry and it is nice that you are helpling them with the money from the ice cream truck. People love the ice cream and that they are helping people at the same time. I asked the guy serving the ice cream for chocolate with sprinkles. It was good and it was really cold. I think it is good to give money to poor people and I liked eating the ice cream . I would like you to come back to our school thank you. It was fun to get the ice cream on Friday, and I loved it. I got vanilla ice cream and rainbow sprinkles. I think it is really nice that you are giving this money to help local food pantries. That is really kind. Come back to 373 R soon. Thank you from A.J. I think it is really nice that you do this bring ice cream and help the poor people. I would also like to help the poor people myself. I love chocolate ice cream with rainbow sprinkles. I like eating ice cream. Your ice cream was sweet and good. The people on the truck were nice. I love that the money goes to charity. I love vanilla ice cream with sprinkles. I like it but I dropped my ice cream. I hope you come back. I say yes to helping people who don’t have food. I had a vanilla ice cream. It tasted good and sweet. It was delicious. I like that you help poorer people. Come back to P.S.373R so I can get more vanilla ice cream. I had chocolate ice cream with sprinkles on a waffle cone it was good and cold. I want them to help people who do not have food. The ice cream was delicious. It was very nice of you to give it to us kids. We really had a great time eating it. It was a hot day. I liked the ice cream. It was vanilla. Thank you. The ice cream was tasty. I would like to eat some more. We are all happy. I ate the ice cream with my friends. We liked it.